Radiant Heat floors have been an efficient way to bring warmth to a space for many years. Now, with modern plumbing and design, radiant heat flooring proves itself to be very efficient for today’s homes. What is a Radiant Heat Flooring System? 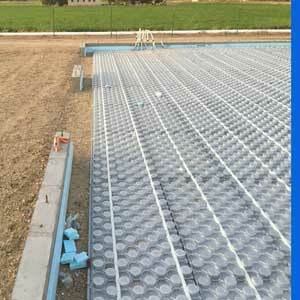 Radiant Heat Flooring System is made of a layer of special tubular piping over a layer of foam and then covered with concrete or tile flooring. The tubing is pumped full of hot water or other solution, heating the floor and keeping the area warm and comfortable. Radiant Heat Flooring System keeps solid surface flooring such as concrete or tile floors warm and comfortable. The heat zone is down to the floor where it is needed. This heating method works particularly well in areas with high ceilings. Forced Hot Air heating dollars will dissipate into your higher ceiling, whereas Radiant Heating dollars will stay to the lower portion of the space, creating a more efficient heat source. If the Radiant Heat Flooring System is under a driveway, walkway or outdoor space, a sensor is installed within the concrete which switches the system on as it senses snow falling on the concrete. This warms the concrete, melting the snow off of the driveway, walkway or other outdoor space, leaving the surface clear and dry. Read about a recent installation of a Radiant Heat Flooring System we did. The homeowner won't have to worry about shoveling his driveway or walkway ever again. If Radiant Heat interests you, contact us.